Castle Leslie is a beautiful Scottish Baronial style manor built in the year 1871. 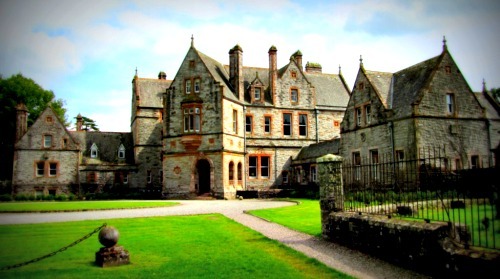 It has been home to an Irish branch of Clan Leslie since it was originally built for Sir John Leslie, 1st Baronet, Mp. The Manor stands in a 1000 acre estate which includes 3 lakes, several forests, a number of streams and a large portion of parkland. It was built upon the site of an earlier castle which stood here, though it did not hold any military value and little is known about its past. Today the estate is open to guests for various functions such as weddings and conferences. It has also recently had its guest capacity expanded with the addition of several new rooms and spa features. The most famous event to happen here was the wedding of Sir Paul McCartney to Heather Mills in 2002. After the wedding the house was flooded with reservations and event bookings. So is Castle Leslie Haunted? The castle has several ghosts, most of which seem to be past residents of the estate. The banquet hall is probably the area paranormal activity can be found the most frequently. Reports of the apparition of a monk being seen in this room have been reported on a number of occasions, often walking clean through walls. The sounds of children crying have also been heard a number of times in this room, though upon investigation no possible source is ever found. One of the families past members also haunts the banquet hall, and is thought to be the spirit of Norman Leslie, who died during the war in 1914. People who have claimed to have seen his spirit have likened his apparition to the portrait of him which stands in the hall. The basement is another hot spot of the building and recently a story has come from a member of the estates staff who claimed to have gone down into the basement, and upon looking up she saw an old man, dressed all in grey who lunged towards here, only to disappear into thin air just before making contact. The Mauve bedroom is believed to be haunted by another of the families past members, Lady Constance. The story comes from a past family member, Lady Leonie, as she lay on her death bed and was also witnessed by her carer. One night as she lay in her final moments a woman entered the room and offered comforting words to Lady Leonie as she lay dying, then simply walked out the room and disappeared. After the funeral the carer was in the dining room when she saw a portrait on the wall of the woman who visited the night before. The family members said that this could not have been possible, since the portrait was of Lady Constance, who died in 1925.